Committing to run a marathon is not something to take lightly. Signing up to run 26.2 miles in the middle of the night during a New Orleans summer is downright ludicrous. For the past 12 years, locals have taken on the challenge with Race MD's Hotter Than Hell Marathon. 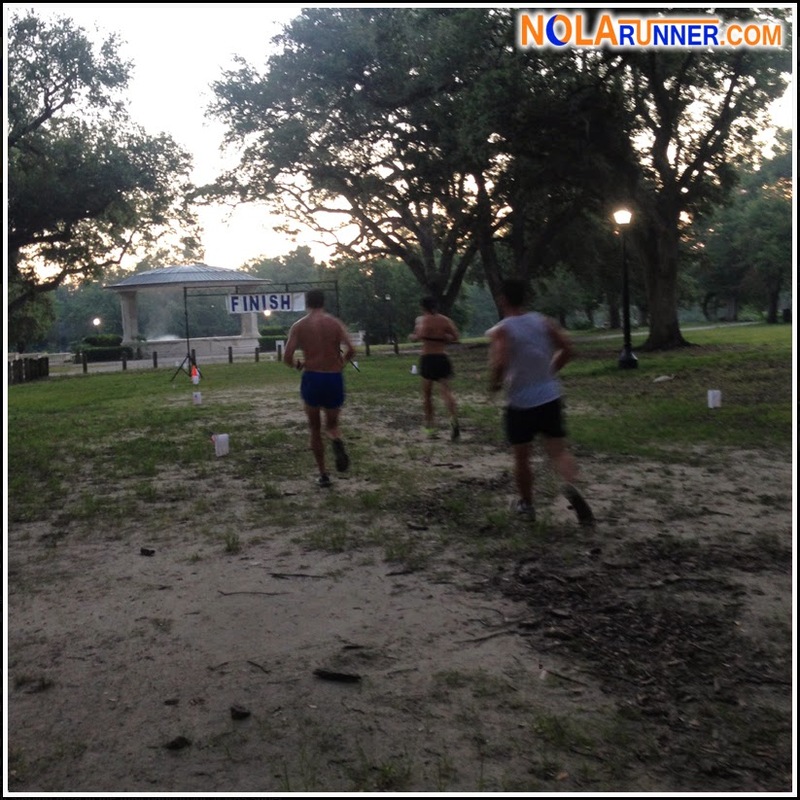 On Sunday morning, Audubon Park was buzzing in the wee hours for the race. Annually, participants cap off their Independence Day weekend by laughing in the face of high humidity and temperatures that hover in the 80's. This year we lucked out with lower than normal temperatures, minimum humidity, and a slight breeze that occasionally stirred the oaks along the course. Ideal conditions for a race that comes with the warning "Hotter Than Hell" in its name. When I arrived at Audubon Park shortly before midnight, athletes had already started to stake out their spots Mardi Gras parade style. Folding chairs, tables, and coolers extended along the parking lot's perimeter as makeshift aid stations were set up. Many runners, members of the Louisiana Ultra Runners club, had already started their race hours prior and were whizzing by as I set up my spread. When I went to put my name on the dry erase board where I would tally my laps, I bumped into running friend Janel. She was already in her 8th loop en-route to a 50K. Overachiever. Unlike most of my marathons, I wasn't married to the idea of completing 26.2 miles on Sunday morning. In fact, I was happy to go out and complete as many laps as possible before calling it quits. There were no goals in mind, except to run for fun and finish injury free. However, I should know myself better than to think I'd be satisfied with anything less than everything. After marking hashes on the dry-erase board to represent my first five laps, I was determined to go all the way. The first batch of laps right after midnight were the most fun, with the highest number of participants on course. Many were beacons in the night, laced with glow sticks and Mardi Gras blinky throws. That light show complimented the blaring music on my iPod, making my own personal rave. The course was simple, 13 laps around the park. Roughly 1.78 of those miles are the asphalt running path. The additional quarter-mile is a loop on a dirt trail under the finish line, past the tally board, and back out through the parking lot to the path. Being the superstitious runner that I am, I detoured around the arch on every loop to make sure I didn't jinx my finish. As the morning progressed, the number of runners thinned out. There were people completing distances of varying lengths at different speeds, but I was determined to keep a slow but steady pace throughout my run. Stopping every two miles to rest and hydrate was not optional, because the lower than normal humidity didn't prevent sweating and fatigue. Finally near daybreak I embarked on my final lap around the park. Thanks to my pacing, I never felt the need for any extensive walk breaks. I was able to finish strong and mark the 13th line on the board before claiming my shirt and medal. During my second to last lap through the finish area, I saw that the post-race food had started to arrive. Jambalaya was being prepared, a snow-ball machine was being set up, and Louisiana Pizza Kitchen Uptown was replenishing carbs with their pasta. However, my eyes locked on the dozens of stacked boxes that most certainly contained doughnuts. Had I known at that moment that the boxes came from Blue Dot, my last lap most certainly would have been significantly faster. In the time that separated my finish from my friend's, I consumed some of all of the above, including two chocolate frosted glazed doughnuts and a doughnut hole. Not an ounce of guilt was felt. This is a fun run with the sole purpose being to raise funds and awareness for the RaceMD cause. Not everyone can tackle the 26.2 miles involved in a "marathon," so there are a lot of people who complete the distance on bike, roller-blades, or any combination of the above. I was surprised by this, because my previous impression of Hotter Than Hell was that it was exclusively running. Making sure people understand the casual execution of the event would bring out more participants who want to help combat Duchene's Muscular Dystrophy. 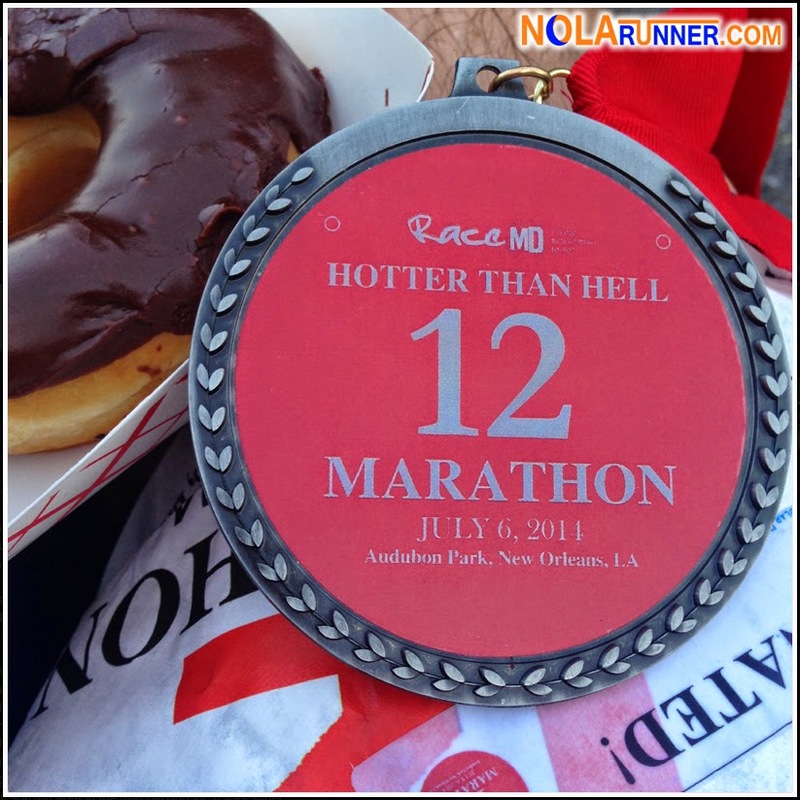 While not a certified event on a certified course, the Hotter Than Hell Marathon is a guaranteed good time. No one should arrive expecting a production along the lines of other marathons in the city; however, the roots of the event are firmly planted in the NOLA running community. I enjoyed the informality of the race and the opportunity it presents to bond with friends during the never-ending Summer months. Celebrating a friend's first 26.2 with champagne served in paper cups out the back of my car isn't something you can do just anywhere, but it sums up this race perfectly. For more information about Race MD, Duchene's Muscular Dystrophy, and the Hotter Than Hell Marathon, click HERE. Check out the below gallery of photos from the 2014 Hotter Than Hell Marathon. If you can't see the gallery, LIKE the NOLArunner Facebook page HERE. I'm so thrilled you were finally able to do this race, and I'm also intrigued by your race recap, since I have never read anything about what this race is ACTUALLY like. Congratulations on this impressive accomplishment! I really didn't know THAT much about it either, and now I know it's hard to call it a "race." With everyone starting at different times, bikes on the course, and no official timing system, it's the longest "fun run" possible and goes to benefit a good cause.